People had talked vaguely about communication satellites before, but he figured out the right way to do it. The idea of orbiting anything was pretty far-fetched in 1945, much less what to do when you were up there. Clarke thought that it would be 50 years before such a service could be built, but it took only 19 – Syncom 3 launched in 1964. There are about 530 operational satellites in GEO now, about 30% of the total. Satellite comm overall is a $200 billion industry today, which is about 2/3 of all space activity. Not bad for a radio technician! Clarke never made a dime off of the idea, but it was worth immortal fame. 4,996,938 (1991) Apparatus for propelling a user in an underwater environment – These were both with his younger brother Michael, who has also been in the Industry as a stuntman and actor. D783522S1 (2017) Solar Power Arrangement – He likes solar power, but admits that the panels are ugly. 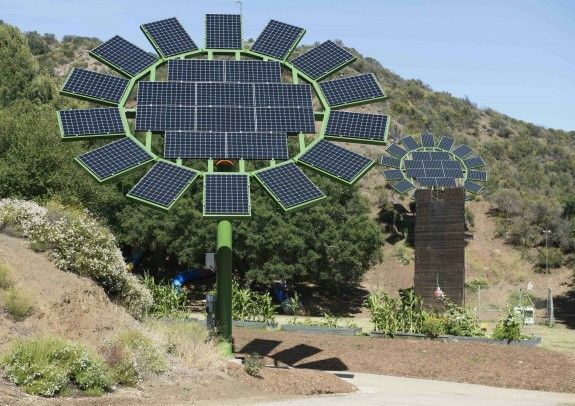 He designed these tracking solar sunflowers for his wife’s school, MUSE, and five of them supply most of the school’s needs. When they came out in 2015 he said that he would open-source the plans, but hasn’t yet. He does appear to be a busy guy. Cameron and a partner, Vincent Pace, were also key to the revival of 3D movies, largely through their Fusion Camera System. This split a single optical path into two stereoscopic ones with a variable distance between them, and allowed for the capture of both 2D and 3D simultaneously. Plus, of course, he has been deeply involved in deep sea diving, using one of his own submersibles to visit the bottom of the Marianas Trench. It’s not clear if he sleeps. GW: I developed it [Pringles]. I did not invent it. That was done by a German gentlemen whose name I’ve forgotten for years. I developed the machine that cooks them. He had invented the basic idea, how to make the potato dough, pressing it between two forms, more or less as in a wrap-around, immersing them in hot cooking oil, and so forth and so on. And we were then called in, I was in the engineering development division, and asked to develop mass production equipment to make these chips. And we divided the task into the dough making/dough rolling portion, which was done by Len Hooper, and the cooking portion, which was done by me, and then the pickoff and salting portion, which was done by someone else, and then the can filling/can sealing portion which was done by a man who was almost driven insane by the program. Because he would develop a machine, and he would have it almost ready to go, and they would say “Oh, instead of 300 cans a minute, make it 500 cans a minute.” And so he would have to throw out a bunch of stuff, and develop the new machine, and when he got that one about ready, they’d say “make it 700 cans a minute.” And they almost put him in a mental hospital. He took his job very seriously and he just about flipped out. Pringles are everywhere – I’ve seen them lining the shelves of Central Asian convenience stores. Maybe that’s because one can make 700 cans a minute. Wolfe was also the robotics editor at Plant Engineering magazine in the 1970s before switching to writing full-time. How Pringles and manufacturing robots got him to think about far-future medievalist societies is mysterious. Neal Stephenson – and four others received US patent 9,037,478 in 2015 for “Substance Allocation System and Method for Ingestible Product Preparation System and Method”. It’s written in impenetrable patent-ese, but appears to be a machine that will mix a dose of a drug like aspirin into a something like a smoothie. It was assigned to Elwha, a patent troll outfit started by Nathan Myrvold, formerly CTO of Microsoft. Stephenson appears to have gotten several patents associated with this, and Myrvold is on some of them. This may be an attempt to lock up the concept of a personalized food fabricator. Stephenson is also into western martial arts, and tried to develop a sword-fighting video game called CLANG. It would have had a sword-like motion controller and use actual fighting styles. He raised half a million for it on Kickstarter here. , but that doesn’t go all that far for a real game, and it never shipped. He now has the title Chief Futurist at Magic Leap, a secretive augmented reality company with some new display scheme. They too are having trouble getting anything out, but he is more concerned with what the best use of this tech is. That sounds more up a writer’s alley than getting embedded controllers to work in swords and food makers. Robert L Forward – inventor of the StarWisp interstellar craft concept and interesting solar sails, and author of the notable novel Dragon’s Egg, about life on a neutron star. Geoff Landis – actual NASA researcher on the Mars rover missions and advanced propulsion concepts, and Hugo and Nebula award winning short story writer. David Brin – holder of US7124372B2 “Interactive communication between a plurality of users”, and notable author of the Uplift trilogy. Leo Szilard – discoverer of the fission chain reaction, which he actually patented in Britain in 1934 as GB 630726. In 1961 he published a book of SF short stories, The Voice of the Dolphin, where the title story is about how dolphins use scientists as fronts to save the world. These are all I could find! I’m sure there are more, but perhaps writing invention and mechanical invention are very different skills. One or the other can certainly occupy all your time! This entry was posted in Uncategorized and tagged inventing, sf-ish. Bookmark the permalink.